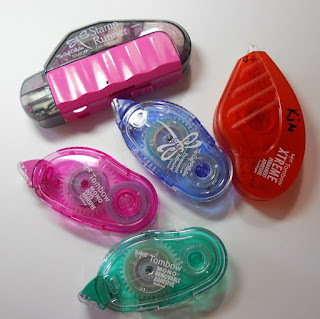 Dry Glues, Wet Glues, Tape Runners, Gel Medium or Modge Podge?!?! What adhesive do I need and when?!?! The simple answer is you use the adhesive that is right for the application you want. The problem is knowing which one that is when you are starting out. First off, what is a dry glue and a wet glue? Dry Glues are glues that are sticky but not wet. These are mainly tape runners, foam tapes, glue dots and normal tape. They adhere instantly and do not require any drying time, which is great for quick applications. The down side is they never DRY, which means the adhesive is always active until the chemical composition of the adhesive breaks down. This is the reason months afterwards you can pull things apart still or remove it entirely with the help of a heat gun. This is also the reason things stick when you don’t want them to-like putting a piece of paper in a pocket you made and it gets stuck. Wet Glues are glues that start off sticky and wet. These are mainly your normal Elmer’s Style Glues, Gel Mediums and Modge Podge. They require some time to dry before you can move on or use the object. The benefit is once they are dry they are dry and no longer active. They will, like dry glues, break down as the chemical compounds break down over time but you will not be able to pull apart items without wrecking one of them and pockets won’t keep the papers you stick in them. Wet glues are tend to have stronger adhesion when dry because they actually dry and bond with the paper rather just sitting on the surface like a dry glue. The one thing against wet glue-they contain water which is absorbed by the paper pulp and can warp the paper a bit. Usually, this goes away after the glue is dry. IF it really gets warped, you might have used too much glue or the wrong type of wet glue. Also-humidity plays a large factor in dry time in our state with wet glues. Some can take longer to dry if the humidity is high. Non-porous surfaces need special glues to hold things together. Otherwise like a dry glue, they can peel apart (though far easier than paper using dry glues). Hot Glue- starts of dry but with the application of heat becomes wet (and very hot). The benefit it dries rather strong and quickly, which is a good thing. The downside-reapplication of heat will reactivate the glue and cause it to enter the wet phase again and sometimes it can pull away from the surfaces easier. If you use hot glue a lot, have a small bucket of water nearby. IF you get glue on your skin dunk it in the water, don’t try to wipe it off (instinct) because you will make it worse. Tape Runner are double sided tape in an applicator that makes it easier to apply than a normal tape dispenser. The two main forms are Permanent and Removable. Removable is used when you want to figure out where to place things but might be moving around or things you want to able to remove after a period of time easily. Some are stronger than others, some come in longer lengths and some require a bit more work to use (peeling paper backings or having to cut the tape rather than flick or tear). Foam Tape is very similar to double sided tape but has a piece of foam sandwiched between two tapes. Not all foam tape is created equal-I buy the Scotch brand on rolls because the less expensive versions, I have found are less expensive for a reason, the adhesive will separate from the foam after a period of time (and not a long one). 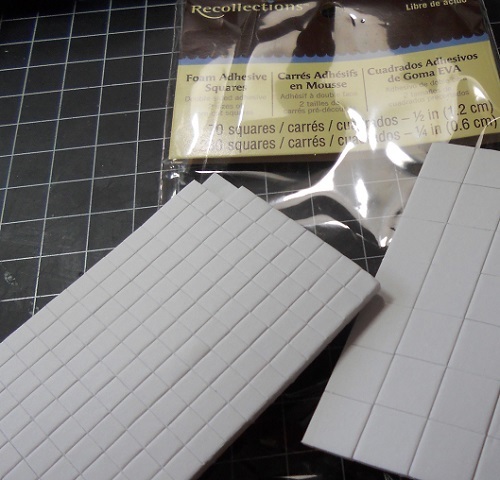 You can also get foam tape in the form of small shapes-mainly squares and circles. I prefer the squares over the circles because usually the circles are cut out of large piece of foam tape and you have a lot of waste over a square. If you need to tape a large area- you can use thin craft foam over foam tape. It is more economical and provided even support. You just have to glue or use tape runner to attach elements to it. 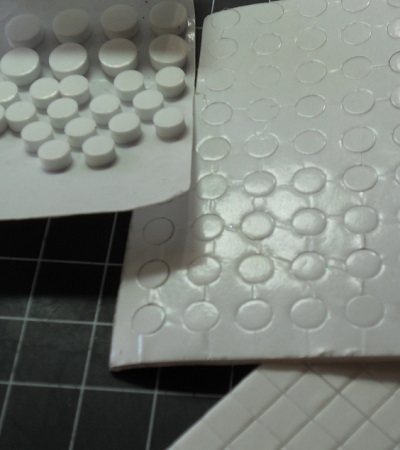 Glue Dots are basically sticky pieces of soft plastic. Think of it as a blob of always sticky glue applied to a backing for storage and handling. They usually have a strong adhesion and are good to hold small rhinestones on scrapbooking elements or paper. OR for items meant to be temporary like a small box for a party favor. They are a dry glue which means they will never dry and will remain sticky, which can create problems. Tape Runners- TomBow and Scotch ATG. 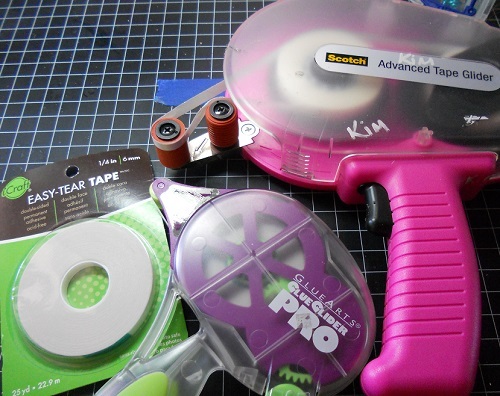 For personal projects-I will use ScorTape also. Foam Tape-I really tend to just use Scotch Foam Tape on the roll. Because I can cut it down as need. I also use craft fun foam sheets-when I have a large embellishment to stick down and want even support. 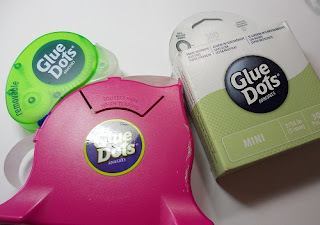 Glue Dots- I used to be a ZOT girl but they are too stick and I have moved to the Glue Dot brand also they have dispensers you can refill that make it a bit easier to use than having to deal with a box and paper tape. PVA Glue was designed for book binding and looks like Elmer’s Glue. The difference is that PVA is pH Neutral, while Elmers because of all the other stuff they put in it is Acidic. For paper crafting, you want a neutral pH, otherwise over time the glue will eat through the paper. Now Elmers does have a craft line of glues which are acid free. But Acid Free is not the same as being pH Neutral. My research into the line states that the pH is more in the Basic side of things over neutral. Plus, I have used CraftBond by them and after being open developed a very strong ammonia smell; it disappeared after drying but stars it was strong. There are formulations of PVA that are better choices than Elmers-Aileens or Scotch Quick Dry. Remember that often to make it glues more economical, they add more water and fillers and that glue you buy at the dollar store might discolor or warp your project. 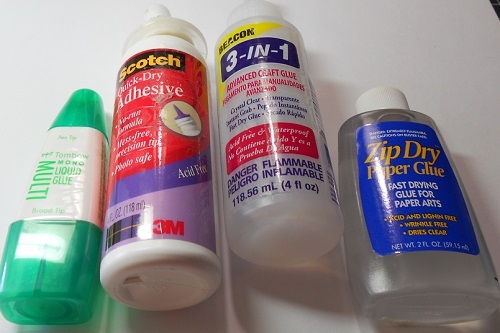 Modge Podge and Decoupage glues are basically chemically watered down versions of PVA that makes them able to glue, seal and provide a finish to paper being applied to a surface. They are designed to hold paper on a surface without discernable surface difference, if done right. So coverage is 100%- under the paper and above the paper. Depending on the product and type, it might make the surface water resistant, matte and/or with shimmer or glittery. Gel Medium is not glue. It is a polymer used in acrylic painting to mix with paints and to adhere items to canvas in their variation of Mixed Media and comes in different finishes and thicknesses. Paper crafters discovered that it could be used for photo transfers and gluing items down so it made the cross over. There are several designed by paper crafting companies saying they are gel medium but I can’t state either way because I have not bought them (considering I have a gallon of artist grade gel medium I don’t see it happening any time soon). What sets gel medium apart it is texture-it is like a heavy milky white gel that dries totally clear. The thing to remember is the word I used earlier POLYMER which for our application is plastic polymers. This is why if you let artist grade acrylic dry on a non-porous surface you can peel it off like a skin of flexible plastic. So it will have flexible plastic surface feel. 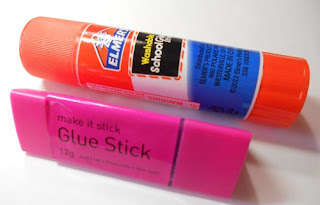 Glue Sticks are glue in a solid form that makes it easier to handle. I only tend to buy once a year- the start of the school year when you can get them rather inexpensively and as long as you don’t open them until needed will last usually until the next start of school. You are looking for acid free and I prefer the one that goes on with a color and dries clear. The key to glue sticks is to be generous with the glue not dabbing here and there, no no no just take it and smear it all over trying to create an even layer. You will find your items will stick better than dabbing it here and there. Gel Medium-Golden or Liquidtex (Liquidtex you can get in a large tube which makes it nice for transportation for classes and easy to use. I use this when I am combining with Artist Grade Acrylic paints over craft paints. Modge Podge Style- I prefer the Collage Pauge line by Aileen which was created by Traci Bauista, a mixed media artist. It comes in both gloss and matte. It is thicker than Modge Podge(which is really watery). PVA Style- Scotch Quick Dry, Zip Dry and TomBow Monoglue. There are other glues I like but some are not easy to get while the ones above can easily be gotten at local chain stores. Things that are going to be opened and closed or pockets for folders where you are pulling and putting items in. Items that need strength to hold or to stand up. Items you want 100% adhesion. Temporary holds (like if you are going to laminate something that shifts). Items you want to stick but does not need to be a strong bond to. Items where paper warping is a concern but the items are light weight. The contents of this blog are the sole responability of myself. Any content, classes,reviews, products or services provided are not endorsed by Michaels. Please feel free to be inspired but please respect the artist and do not copy pictures, projects or content.